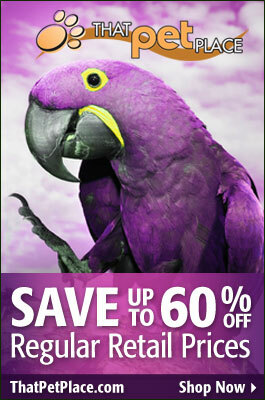 Home | Bird Behavior | The Best Way to Prevent Feather-Plucking – Make Your Parrot Work! A researcher at the Utrecht University Clinic for Companion Animals in the Netherlands offered African Gray Parrots the option of eating from a bowl or removing food from a pipe lined with holes. Healthy birds invariably ignored the food bowls and went right to work on the pipes. Having observed several parrot species in their natural environments, I was not surprised to read this. The search for food takes up most of a wild parrot’s waking hours. Millions of years of evolution have primed them to investigate any and all food-gathering opportunities. Parrots are not domesticated animals whose natural instincts have been greatly modified by selective breeding. It makes sense that, unless starving, they would be impelled to actively forage. I have found this to be true for a huge array of animals ranging from fish to mammals. Pets that meet their food requirements after 10 minutes at the food bowl are prime candidates for behavioral and even physical problems. Interestingly, research has shown that injured rats heal faster when kept in social groups or stimulating environments – could the same apply to parrots? Please see the article linked below. Does Self-Mutilation Fulfill a Need? 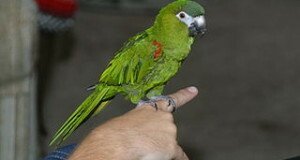 Many who care for and study parrots have noted that feather-plucking often seems to become a replacement for normal behaviors such as searching for food and mate-grooming. Once begun, self-mutilation usually takes on a “life of its own”, often with tragic consequences. Some of the parrots in the Utrecht University had a history of feather-plucking. These individuals showed no interest in solving food puzzles. Researchers theorize that feather plucking took over the role formerly filled by natural foraging/searching behaviors. Why Don’t All Bored Parrots Pluck? 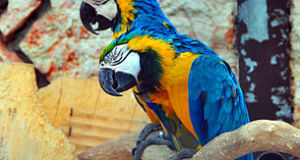 Parrots kept under similar conditions react in very different ways. Signaling chemicals in the brain likely come into play. How these function seems to vary greatly among different species and individuals of the same species. Working from this premise, researchers at Utrecht University are investigating the drug Paroxetine as a means of curtailing feather plucking. Feather-plucking can also be caused by a variety of other environmental and physical factors, including social isolation, sleep deprivation, fear-related stress and poor diet. Please see this article for further information, and be sure to post any questions below. I’ve been dealing with this problem, in both zoos and private collections, for decades, and will do my best to help. No caring person buys a parrot with the intent that it merely “endure” captivity. We want to give them the opportunity to live life to the fullest. These highly intelligent, social birds are a joy to be around…but only if they have the chance to put their complex minds and boundless energies to use. Giving your parrot the largest cage possible is an important first step. When weather permits, outdoor time in an aviary will greatly improve your pet’s quality of life – and your pet-keeping experience! Make the environment as complex as possible by adding appropriate perches and vines, and change these around regularly. Play-stands and out-of-cage time should be used to encourage activity and exploration. A mate or other avian companion is the best option for most birds, but you should also spend as much time as possible with your parrot. In keeping with the study mentioned above, always try to make your bird search for and work for its meals. Try hiding food and spreading meals throughout the day, and experiment with homemade food puzzles (nuts in a closed box, etc.). 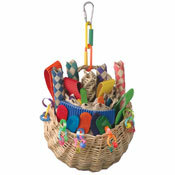 Fortunately, many bird toys are now designed with the specific intent of challenging parrot minds and bodies. In my opinion, the most useful of these use food as a reward. Parrots are adapted to search long and hard for their meals, and will choose to do so when given the opportunity. You may wish to check out more these 50+ exciting foraging toys and educational accessories. Hi, Frank – Great article. It’s going in the November Winged Things. I’m up to 600 subscribers!!! I almost can’t believed it. Frank, As always, your articles are so informative, and thorough. I always enjoy them. I still am Co Editor of the Rocky Mountain Society of Aviculture Newsletter, and always love to get your emails, to be enlightened. You always do such a great job! Great post, I have been worried about my parrot plucking but now I don’t have to, Thanks! Hi frank sorry i m new to this site ..frank i need your help i have a pair of love birds bought from local pet shop since 6 months my husband bought one female and we introduce her to my previous pair they always fights alot 1st female dobt even let the 2nd one come close to male suddenly there was two nest box in my cage one was broken other was occupied by the first pair ..this newly introduced start fight wid them for that nest so i noticed i repair the other nest ..for them to stop fighting …but stil it seems they are not friendly after few days i found they lonely female stays in nest for long time and if the pair comes close to it she ll fight ..so i checked the nest there are four eggs …i m so happy but still i wounder she is not friendly wid the other pair ..may be she was having a patner at pet shop since as she was bought from shop 1 month back ..but they keep fighting screaming all the time i feel sorry for her as she does not have male to help her during this time ..shud i seprate her from othet pair so she can feel safe ..or wat shud i do to comfort her or shud i introduce her a new patner ..i ll b verythank ful to u if u can help me understand them so i can comfort the lonely female. Birds tend to pair up, and often times groups of 3 lead to one bird being left out and stressed. I would definitely recommend removing the bird who is not paired up, at least for now, and look into getting a mate for him/her.